← Has the Captain made his last call? Just because no one is talking about university fees, doesn’t mean they are dead – buried – and cremated. I think they’re just in political hibernation, and will be woken as soon as a pollie feels there’s value in flogging that particular dead horse. Free education for all Australians is to the benefit of Australia, not just the students. It maximizes the potential of Australia’s greatest assets, our children. If we don’t fully develop this asset, then Australia is not advancing at its maximum capacity. Australia can’t afford NOT to have free education for all Australian children. “”CLICK ON IMAGE TO ENLARGE” or click on EDITORIAL/POLITICAL menu above. 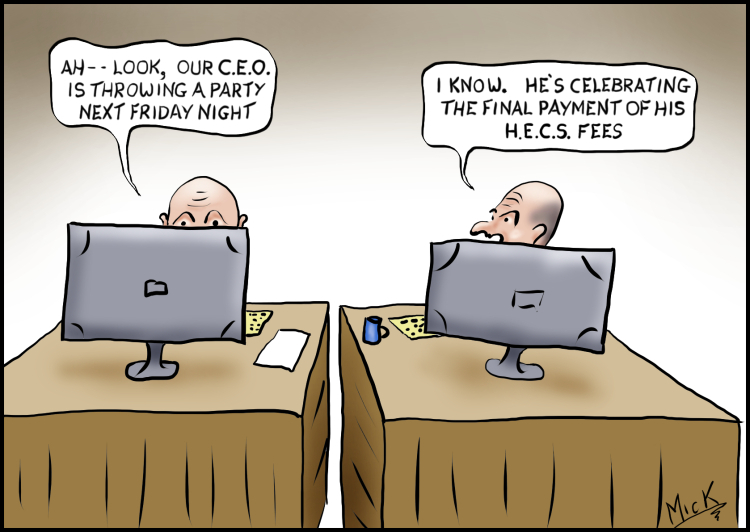 Posted on May 8, 2015, in Cartoon, illustration, humour, humor, caricature, political, art, Australia, Perth, cartoonist, Illustrator and tagged Australia, cartoonist, Education, Family, Government, HECS, humour, News, Political, Politicians, university. Bookmark the permalink. 2 Comments. Thanks Edward. Yes, must keep trickling them out, one never knows when an editor could be in the market for a toonist. Cheers.